12 in '12 - Happy New Year, everyone! The Avengers or Cloud Atlas. The first was just so fun with great dialogue (saw it twice), and the second had amazing make-up artists and kept me thinking for days. 30 Rock, I think- but the DVR is always full :) Love HIMYM, Burn Notice, and Project Runway, too! My favorite "sometimes" treat is from the Cheesecake Factory, but it is amazingly not cheesecake. It's a very good thing the closest Cheesecake Factory is an hour away. I took a chance and moved to 3rd grade (from 2nd). So far, it's been mostly a good thing, I think, and I'm proud of myself for going for it! Favorite silly, amusing thing- with the comment: "My fish died when I wasn't home. Asked my cousin to give him a proper flushing. She sent me this." I think my favorite post was about our BFG Day, but I'm also super proud of just about all of my posts this summer in I Just Got a Teaching Job... Now What?! Stats show me that visitors love my spice up your writing, teacher binder, and lesson plan posts, though. I finished my first year of teaching in my own classroom! I think it might be this one of my husband and my brother. I love that they get along and that they both like to be goofy! At the end of the summer, I got to go down to Texas and spend a few days with my husband after a loooong summer apart. He was able to take a couple of days off of work so we could hang out around town together. Plus, once it was over, I only had about 2 more weeks til he was home for good! As far as school, I loved seeing a student's Airman dad surprise her in my classroom, and our lemonade stand for charity made me so proud. I want to be there for my husband. Between graduating, job searching, and probably moving and starting a new job, he's going to need me to listen, but also to get a lot better about not being a slob- I mean, helping out with cleaning and cooking. In 2013, my husband graduates after 9 years in college. It's incredibly exciting, but will probably mean moving to a new job and new school. For the first time, he will have a "real" full-time job, and who knows if I will be able to find a classroom job right away. With all the change that could happen, or not (depending on the job search), I need to trust in God and in our relationship that everything is working out just as it is supposed to. It's probably going to be a big year. I keep seeing people post about the Connecticut tragedy on Facebook, and it's starting to really bother me. It's becoming a meme- photos and quotes (only half real) spreading like LOLcats, and I can hardly check Facebook without wanting to punch someone. For so many people, this shooting is nothing more than another way to divide themselves. Into liberals and conservatives, into "good parents" and "bad parents," into Christians and heathens. Is more division really what will help those on the fringes of society? Or the rest of us? Too many people think there was one singular cause and therefore there must be one singular solution to fix everything. Too many people think they know what that one singular solution is, and think there can be no compromise. NO tragedy is that simple. And I refuse to believe in any way that God could have wanted this to happen. I refuse to believe for a second that morality or His love are absent from schools just because we don't lead a prayer together every morning but have a moment of silence instead. I may not always put His name on it, but my students are learning right from wrong and to love one another EVERY single day, and I know that's true in many of your classrooms, too. There is no way to blame this on one thing. There was a young boy who may have had autism. He was smart, but it sounds as though the school wasn't able or willing to offer what he needed. There was a mom, who advocated for her son and eventually homeschooled him, clearly trying to do what was best for her child. There was divorce, dividing a family and its security. There was a mental illness, most likely, that crept into the family and caused conflict. The healthcare system, our culture, or even just our brain knowledge kept the illness from being treated as it could be. There was access to guns, which meant that conflict turned deadly. There was a desire to cause pain, a desire whose roots we may never know, that led this man to a school. There was a safety system in place with only small flaws, but they were exposed by terror. There were brave people who kept it from being worse than the tragedy it already was, but still, parents and families go home with one less member to love here on Earth. For so many people, this was a one day event- just a news story, or a problem with a quick fix, or the ride to a political agenda. This was not one day. It was a lifetime leading up to it, and it would take at least as long to fix all of the issues that contributed to this awful tragedy. For me, this is a nightmare. But I'm not sleeping well. I'm moody. My mind is racing whenever I'm not busy. I keep having flashbacks to the moment when my innocence was taken. It was when my dad died. And just when I thought hearing that news, at age 11, was the worst thing that could ever happen, we had to tell my brother. I remember, clearly, watching him absolutely crumble as we told him. It was the worst moment of my life, hands-down. I can't imagine a school full of children like him. As hard as that day was, it was the days after that I remember being worse. The first day, you're in shock, and it doesn't really seem real. But then things start to sink in, and the explanation you've been waiting for somehow doesn't really ever arrive, and you slowly become a different person entirely because there is simply no return to the previous normal. I can't imagine losing people in THIS way, in a way that not only destroys your sense of normalcy but also your sense of safety and security, especially as a child. I know this is negative, and it's not what anyone really wants to read, but I'm so frustrated and I need to get this out to people who might understand. The world is handling this like it happened so far away, but really, it could have happened in MY school, to ME, and to MY class. And I can't stop imagining the situation in my head, wondering if I would have the courage to do what some of those teachers did to protect their kids. But I know that unless I was put into that situation, I could never know for sure. I can't move on yet. My thoughts and prayers will be with those in Newtown for a long time, but especially during the next few weeks and the holidays. It's always a time when I miss my dad more than usual, and I know this first one, especially, will be the hardest for them, too. Even better? They are willing to send you a FREE product just for following them today or tomorrow! (I just got a reading genre book that i am SUPER excited to try out!) Please go check out their sweet blog! While I'm here, I want to tell you to go check out your local Dollar Tree. 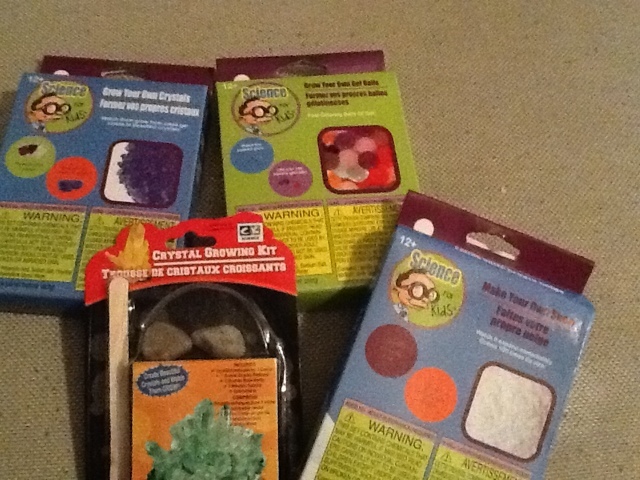 They have GREAT science kits right now- $1.00 apiece! This is the same kind of thing you can find on sites like Steve Spangler, bit in small quantities and for so cheap! These would make such fun student gifts, stocking stuffers for your kids, or even great activities for your class to do together on that crazy last day before break! I also always pick up holiday erasers (24 for $2.00!) to throw in with my student gifts, too. Love that my husband went with me for a Super Productive Morning (with stops to browse at Target and Dollar Tree- yeah!) Hope you are having a great weekend!